The news of the genome sequencing of the famous “living fossil” coelacanth raises interesting questions. This isn’t because of any relationship to the established Young Earth Creationist suggestion that it disproves evolution and the old earth, but because it does make for some apparent difficulties for the reigning paradigm of Neodarwinism (but what doesn’t nowadays?). Although coelacanths are often called “living fossils”, these fish haven’t really been frozen in time, says co-author Kerstin Lindblad-Toh, a comparative genomicist at Uppsala University in Sweden. Comparison of protein-coding genes in coelacanths with those of cartilaginous fishes shows that the coelacanths have been steadily accruing DNA changes. But the rate of change has been remarkably slow. The latest analysis shows that the genes of modern coelacanths can themselves be considered living fossils, says James Noonan, a geneticist at Yale University in New Haven, Connecticut. Scientists already had hints of the coelacanth’s sluggish evolution. In a 2012 study, researchers in Japan and Tanzania compared the DNA of the African and Indonesian coelacanths. Specifically, they looked at HOX genes, which help to guide embryonic development (K. Higasa et al. Gene 505, 324–332; 2012). Even though the two species separated, by one estimate, perhaps 6 million years ago, their genes are remarkably similar. For these particular genes, the difference between the two species of coelacanth was about 11 times smaller than that between the HOX genes of humans and chimps, two species that parted ways perhaps 6 million to 8 million years ago. I’m not sure how the split has been dated, since the common tool now is the “molecular clock” of a standard averaged rate of mutation. In this case, that molecular clock seems to have run 11 times slower than in the human lineage, which has to cast doubt on its usefulness as a dating method across the board, and therefore its common role in correcting the chronology of palaeontology and hence the patterns of phylogenesis. Be that as it may the new study, by showing the whole genome is less variable than anticipated, confirms that this slow mutation is a general feature of the coelacanth, not just its HOX genes. The analysis showed that not all parts of the coelacanth genome are slow to evolve. The genome has a large number of transposable elements — non-coding parts of the genome that have an important role in gene regulation — that have been moving around in the genome at a relatively rapid pace. Non-coding DNA could be a significant source of evolutionary change, Lindblad-Toh says. But Amemiya adds that, for now, the role of non-coding DNA in speciation is “speculative”, and its significance in coelacanth evolution is not clear. To remind you, transposable elements are part of what has been called “junk DNA”, self-serving parasitic viral sequences in the cell; but they are also what James Shapiro has focused on in his “natural genetic engineering.” So they may well mean something very interesting here, if as Shapiro’s work suggests such elements are control elements and maybe of even more importance in evolution that protein-coding genes. Of course, nobody knows. 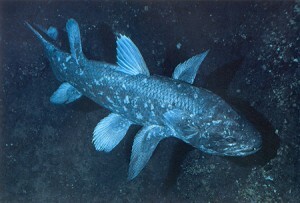 The genes of the coelacanth have a lower rate of “substitution” – a type of mutation – than other animals with backbones, which may reflect the fact that they do not need to evolve quickly because they live in the relatively unchanging environment of deep-sea caves where there are few predators, the researchers say. “We often talk about how species have changed over time. But there are still a few places on Earth where organisms don’t have to change, and this is one of them,” said Kerstin Lindblad-Toh, scientific director of the Broad Institute’s vertebrate genome biology group, a co-author of the study. In this study, we have confirmed that the protein-coding genes of L. chalumnae show a decreased substitution rate compared to those of other sequenced vertebrates, even though its genome as a whole does not show evidence of low genome plasticity. The reason for this lower substitution rate is still unknown, although a static habitat and a lack of predation over evolutionary timescales could be contributing factors to a lower need for adaptation. There are a couple of problems with that, though. In the first place, many fossil species of coelacanth have been found from both salt and fresh water, all morphologically quite similar (which is, of course, how they were identified when discovered alive in 1938). So if they’re now perfectly adapted to their unusual environment, it appears to be fortuitous, like happening to discover unchanged carboniferous cockroaches living only in lava flows or pitcher plants. Coelacanths are most likely prey to large deep-water predators. Shark bite marks have been seen on coelacanths and sharks are very common in areas inhabited by coelacanths. So we are asked to believe that, though sharks have been eating them for 500 million years, there has been no selective pressure on them for better defences of some sort, or at least variations that might potentially diminish the losses. A There is no mutation. Note that mutation is quite separate from natural selection, so the latter can’t possibly explain coelacanth’s lower mutation rate. If the “need to adapt” is a factor in the lack of HOX or other mutations, then the mutations are not random, as evolutionary theory demands. For mutation rates themselves to change according to environmental “need”, something like “natural genetic engineering” would be required: the fish themselves would be controlling the type and rate of their mutations. And if that’s true of coelacanths, it should also be true of all other species, and evolution driven by a completely different dynamic than we are told in the mainstream theory. B There is no natural selection. I’ve dealt with that above: there actually seem to be, in this case, plenty of pressures for selection in their environment, though of course it is always possible, though circular, to say they must be perfectly adapted because they don’t change much. But is it really credible that over many millions of years no one allele has been favoured over alternatives, that there has been no environmental change, no change in other competitive species etc? C There is no net migration. In other words, Hardy-Weinberg assumes that no genes come into or move out of the breeding population – implying a randomly interbreeding single population. Are individuals of the two coelacanth species numerous enough, and closely packed enough, for that to be true? See below. D The population is infinitely large. Small populations, like small samples, are subject to chance deviations from the expected. The smaller the population, the greater is the probability that the parental gene frequency will not be faithfully reproduced in the offspring generation. These additional discoveries likely push the worldwide population up and over 1,000. In any event, the coelacanth remains a very rare creature, probably deserving of its endangered Appendix I status in the C.I.T.E.S. listings. And round and round and round. So which is wrong? The stuff about natural selection, or lack of it? Or the stuff about coelacanth being quite happy as it is and seeing no reason to change? As I’ve said, organisms don’t “do” natural selection – it happens to them, by definition. In any case, in Neodarwinian theory organisms don’t “do” mutations either – they too are something organisms suffer passively, so neither natural selction, nor lack of it, could change the mutation rates. However, it might be that Neodarwinism is wrong about mutations not being activated by organisms. (It can’t be wrong about natural selection, which is by definition what the environment inflicts on organisms). In that case, the teleological language would not be metaphorical, but commonsensical: coelacanths are happy enough (for whatever God-given reasons) to stay as they are for longer, so they reset their mutation rates to achieve it. I think that would be quite a far-reaching result for one study. This entry was posted in Science, Theology. Bookmark the permalink. Consensus rules, OK? Or not.